"I had a day off and took a chance when I saw the contest on Facebook. I had a very strong feeling that the bike was hidden at or near Café Baisikeli. I jumped on my good old iron horse and rode from Nørrebro to Vesterbro. I had in no way expected that I would be first, so I had prepared myself to compete with three to four other people. That's why I learned the code by heart, so I would not have to waste time looking it up. But when I came, I was the only person there who knew about the Jopo. I opened the locks with shaky hands and I still could not really believe it - but then the lock opened and I was just really happy. There was a couple with their baby in the Café who were looking at me, amused. But I didn't care, I just jumped around with joy! The jopo is really fun! I'm really looking forward to riding it and it looks so cool! I am a very happy winner." Could we tell your story next week? 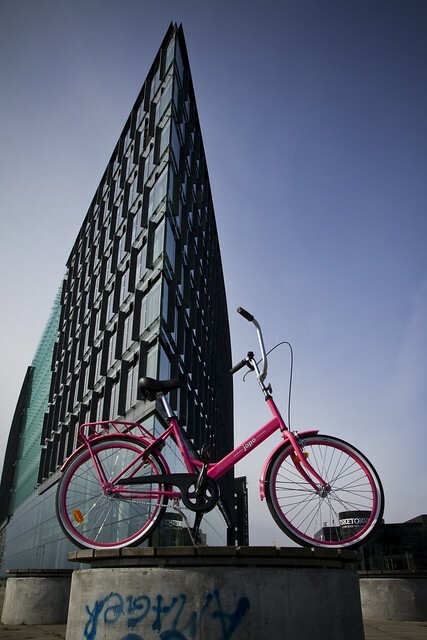 A new jopo is being hidden in a secret location in Copenhagen as we speak. So stop by tomorrow for the first hint! I'm sure that this is important and beautiful prose, but being dark green on black I cannot read it. Congratulations Laura! Have a nice ride!